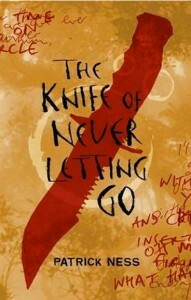 Book: The Knife of Never Letting Go by Patrick NessSeries: Chaos Walking, Book 1Genre: Fiction/Young Adult/Sci Fi/DystopianPrentisstown isn't like other towns. Everyone can hear everyone else's thoughts in an overwhelming, never-ending stream of Noise. Just a month away from the birthday that will make him a man, Todd and his dog, Manchee -- whose thoughts Todd can hear too, whether he wants to or not -- stumble upon an area of complete silence. They find that in a town where privacy is impossible, something terrible has been hidden -- a secret so awful that Todd and Manchee must run for their lives.But how do you escape when your pursuers can hear your every thought?If you're a reader: prepare to have your heartstrings torn apart. This is a fast-paced story, with a vivid dystopian world, plenty of action and dangling plot reveals galore to keep you reading even when you want to give Todd a good kick in the shins. ""You're tearing me *apart*, Patrick Ness! ""If you're a writer: prepare to have your heartstrings torn apart, and your writer-brain given a good education. Want to know how to make a difficult-to-like (ignorant, bull-headed prejudiced, angry) character loveable? Want to know how to write a convincing male character, from teenage mood swings to some words being misspelled cuz he ain't had much of an educayshun? Want to know how to reveal information slowly without frustrating your readers? Step right up and get reading.There are so many secrets in this story that you want to find out the answer to. You know the secrets are there because Todd is constantly doubting and second-guessing his info and other characters are fighting not to spill the beans.So Ness keeps feeding you important information, big shocking reveals, while putting obstacles in the way to stop you finding out the whole picture all at once. For instance: in a world where everyone can hear your thoughts, knowing too much is a liability so a lot of info is kept from Todd so that it can't be overheard. And a lot of the important info is in a book Todd carries everywhere, but he's illiterate and too proud and defensive to admit he can't read it.Patrick has an impressively strong grasp of how to withhold information without it feeling forced or unrealistic, and how to 'drip-feed' important information to the readers without overwhelming them.Either way: This is an interesting and dark dystopian that breaks out of the genre box and takes a lot of risks. While these risks (the misspelled narration, the constant dangling of plot info in front of your face) might lose it a few fans, it'll earn Patrick Ness many, many more.I'll definitely be picking up the sequel, though after the emotional throat-punch that was this book I might have to take a break in-between.